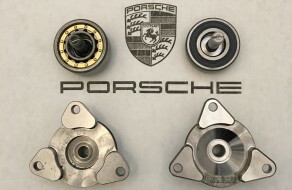 If you own a 986 Boxster, 996 911 or an early 987 Boxster, your engine is likely to be running the original Porsche IMS bearing. Failure of this bearing has caused numerous engine failures and is one of the few ‘weak links’ in the M96 and early M97 engines. D&G have been fitting uprated bearings since we opened in 2013. Although a worthwhile engine preservation modification in it’s own right, it is a popular upgrade when undertaking a clutch replacement as the clutch assembly has to be removed to replace the IMS bearing. More and more people are choosing to only buy cars that have had IMS bearing upgrades. As a result, cars with the upgrade command a small premium and sell easier than cars without the upgrade. We currently supply and fit a number of different uprated bearings from the EPS roller bearing to the LN engineering ceramic bearing. We can also fit a like for like steel bearing but advise these to be changed periodically every 40k miles to avoid engine failure and big repair bills.